Hyundai is stepping into augmented reality, but not the way Mini Cooper has with AR glasses. Rather, the Korean car company wants to put AR car manuals in your hands. Hyundai will release a free app called the Hyundai Virtual Guide that will be available later this year on iOS and Android devices. At launch, the Hyundai Virtual Guide will be able to recognize more than 45 features of the 2015 Sonata. The guide uses two- and three-dimensional tracking technology, allowing you to position your phone or tablet's camera over various parts of the car to get more information. The Hyundai Virtual Guide can virtually identify and provide how-to information about the air filter, Smart Cruise Control, Bluetooth phone pairing, warning indicators, engine oil, brake fluid, clock, fuse box and smart trunk. 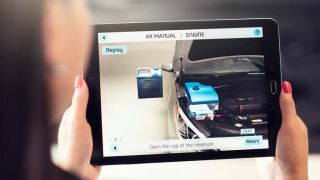 Hyundai states there are six 3D overlays that will pop up on your device after scanning various parts of the car, but it won't show you AR how-to's for everything. However, scanning the car should bring up one of the 82 instructional videos included in the manual. The 2015 Sonata won't be the only car with an AR manual - Hyundai will be integrating other car models at an unspecified date. Did Google Maps just kill sat nav?